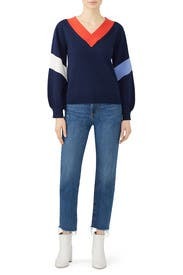 Parker updates classic varsity styling with bold colorblock stripes and puffed sleeves for a more of-the-moment look. 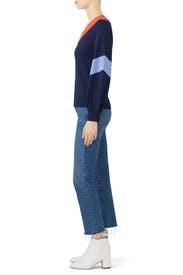 Blue colorblock knit (50% Modal, 50% Polyester). Sweater. Long sleeves. V-neckline. 23" from shoulder to hemline. Imported. Puffed arms aren't overdone and give the illusion of a smaller torso. Neckline was nice for a large bust. Does run a bit short so you'll need to wear high waisted pant if you're of average height. Slightly on the crop side. Gorgeous color blocks that make you stand out from the crowd. 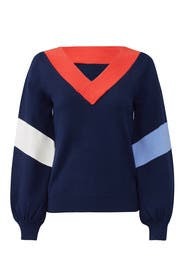 Sport, fun sweater with retro appeal! Super comfy and cool. Does run slightly cropped, so recommend wearing high-waisted pants or sizing up if you have a longer torso. I LIVE this sweater and I should have purchased it. 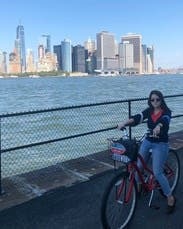 Wore it on vacation to New York and it was awesome. So comfortable and not heavy. Highly recommend. This is much shorter than I realized. If I had read the other reviews I probably would have caught this earlier! Cute though. Flattering cut, fits flat, not bulky. Sleeves are fitted at the shoulder and a little puffy around elbows. 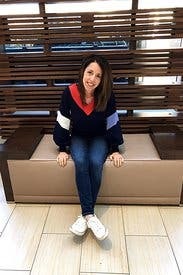 This was a great causal sweater- warm and cozy and stylish. It runs more fitted so if you want it oversized I would recommend going up one size. Very chic for an everyday stroll down the street. Our local homeless man told me I looked gorgeous. Cute cinched wait. Billowed wrist details that aren't overwhelming. Striking colors. Flattering neckline. Soft material. The sweater was so comfortable and perfect for a late fall weekend. I got so many complements on it. The material is thick and well made. 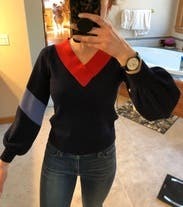 The length of the sweater is a bit shorter than it looked in the pictures, but paired with high waisted jeans it was perfect! Great sweatshirt. Awesome sleeves. Didn't get a chance to wear it unfortunately because it's been too cold here for it. It's designed to be short- it hit at the top of my jeans, so kind of impractical to wear when it's cold outside! Wore this with a flared, high waisted skirt which worked perfectly! On its own, the top would've been less cute with just jeans OR I maybe should've gone a size up as I have a long waist. Absolutely loved this sweater. I would definitely rent again. The colors are vibrant and fun but still appropriate for work too. I usually wear a small top but the medium fit me fine, it's a bit shorter so would recommend sizing up just in case. Fab style but short in the sleeves! A bit of a snug fit, not good for my mum tum! But a great style and very flattering otherwise. LOVED this sweater. As other reviewers mentioned, it does fit tighter and more cropped than anticipated, but it looked SO flattering. The color blocking and v-neck is just perfectly done, as well as the shape of the sleeves. This was perfect for celebrating the Patriots SuperBowl win! I really didn't want to send this one back. Warm and cozy sweater. It fit perfect ! Fit perfectly and exactly as described. I would have bought it if the price was lower. 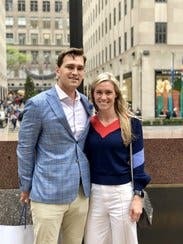 Loved everything about this sweater! The sweater is comfortable and warm. I loved how the sleeves were fitted at the wrist but blouses through the arm. The quality of this sweater is exceptional and it is soft. The colors were perfect for a rather cool spring day in Dallas. The sweater is not long but not too short. It was just long enough for me. It's a cute design but the fit made it nothing special. I had to keep the sleeves scrunched up because they were too short. I'd order a size up if you have long arms. Wouldn't rent again. Cute, warm sweater with really good colors. I initially got XS and wore it to work, I thought it was a little too snug and cropped so I tried a S and that for me was perfect. Great for fall! Loved the sleeves and where it fit on my body! Didn't look too awkward on my body because of where it hit. Sometimes sweaters are too long and look weird with jeans. 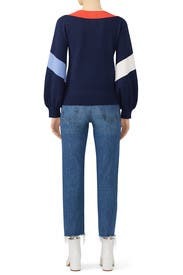 The sweater is really well made and the color combo is really cute. It is pretty short, so high waisted jeans and a tank underneath were a must for me to wear this without showing mid section. The sleeves are also a bit short and did not go all the way down to my wrists.